As many of you know, in 2017, Puerto Rico got hit by a devastating hurricane called Maria. Soon after the hurricane, I started to help families around the island using Diy Solar Generators that I put together using 18650 recycled batteries and equipment. Some of the generators built in the USA by members of the Diy community and others were made by me. Thanks to God, we manage to help 49 families around the island... the goal was 100...!!! We couldn't help more families because it took so long to put together a battery pack for a generator that by the time one device was done and ready to install, the family got their power restored. After summer 2018 I started to tinker with the idea of a battery kit that allowed me to build diy battery packs fast and easy. That's when the Diy PCB Battery Kit was born. On this video I show you the humble beginnings of the battery kit. The Diy Powerwall Battery kit was created to help the average person get a reliable source of energy storage fast and easy. When a pack like this was made in the past, the person had to solder the cells using heat from a soldering gun or using a spot welder which can be expensive. Now, they only have to place the cells on the board and make the proper connections, saving time and money while getting a sense of relieve and satisfaction. - Diy Solar Energy community: We all want a reliable source of energy but we don't want to break the bank. A kit like this allows us to make Powerwalls fast and easy. 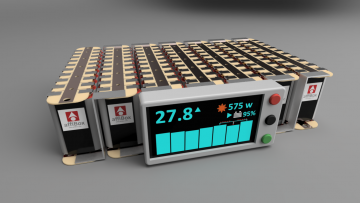 - Non-Profit Organizations: With a kit like this we can provide solar energy to remote areas while helping the planet sense we are using recycled lithium batteries that will end on a landfill if we don't act fast. By having access to a battery kit they can deploy a camp anywhere and use the diy powerwall for lights and medical equipment without the need of gas generators. They can also use the kit to donate solar generators around the world. - Low income families: There is power in knowledge and the poor tend to pay the price because of this. Imagine a world where a low income family can have access to reliable energy storage that they've put together and with the savings they get from the utility bills, they can now use that money for a better education for their kids. What will I do with the funds. I make and manufacture the powerwall kits at home and by myself. Thank God I have a large list of back orders but the amount of work is way too much for just one person to handle, specially without the proper tools and hardware. - Mass Manufacturing the kit: I already have a process figure out that allows me to make 100 - 200 kits per week. Its a very reliable process and with the right tools I'll be able to produce 10 times that, maybe more. - Job creation: I'll like to hire 1 or 2 people to start working on the project while I focus on making workshops on and offline. There's a second part of the project that needs my attention which is the Super Smart Battery Management System and I'll like to start working on it, ASAP. - Working Space: Right now I work at my house in a small 20'x8' space that I share with the laundry. I need a better working space to be able to expand the operation and also be able to hire employees and do workshops for the local community and the online crowd. The SSBms or Super Smart Battery Management System is a most have tool on every Diy Powerwall that gets created. It prevents overcharging, over-discharging, overheating among other functionalities. I'll share the progress over my YouTube channel but in the meantime these are the functionalities that we want to have on the SSBms. - Capable of working with Samsung Smart-things and Google Home. - Power management of the house: Ex, Turn off a light remotely or shutoff the whole Powerwall from anywhere. These are some of the core functionalities that we are looking to have on the SSBms but there is room to grow and that's why we will Open-Source the code to help out the community while also growing the software to its full potential. When the time comes we will also release the PCB design for the battery kit and the SSBms as an Open-Source license for personal use and non-profit organizations. This will allow us to help more families in Puerto Rico and other remote areas while also creating jobs and more resilient homes around the world. I'll be forever grateful for the help that I got from the community when I was helping the families on Puerto Rico. 49 homes is not a small number, but now, with your help, we can reach millions of families around the globe faster than ever while reducing the e-waste contamination that these cells produce when they end up in a land fill. Thanks in advance for any help you can provide for this project.